Ukrainian ultra-nationalist groups actively fought on Maidan to overthrow President Yanukovich. Now as the fierce riots in Kiev are over, they are unwilling to give up their violent ways, unleashing their “revolutionary” power against local authorities. They hide their faces behind masks. They wear jeans and camouflage, helmets and bulletproof vests. Their arsenal is not rich, but it's quite powerful: spiked ball maces, baseball bats, batons, spades, and flames. 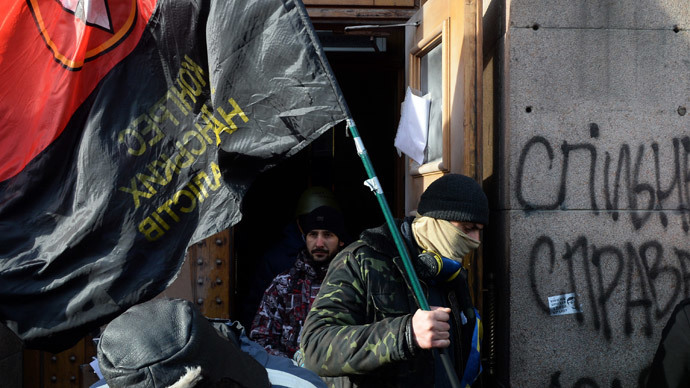 Under the guise of "self defense units,” they attack activists without distinction in Kiev. On February 15, activists from 'For a Clean Kiev' gathered to sweep up the mess, collect trash, and dismantle the barricades across the city’s main central square that was at the heart of the revolt. But radicals blocked them from doing so. Armed youngsters then chased down the crowd of activists, knocking them off their feet and beating them with batons and bats. Hapless onlookers were dragged into the scuffle. One man with his face covered in blood said he was shielding his wife when a group of five to 10 “Maidan protesters” suddenly attacked them and battered him with baseball bats. Ultra-nationalist groups that took an active part in overthrowing the ruling regime at Kiev’s Independent Square now want to repeat their success in other regions of Ukraine. They want “Ukraine for Ukrainians.” Its members salute in a Nazi style and shout nationalist slogans like “Glory to the nation! Death to enemies!" Far-right activist Aleksandr Muzychko, aka “Sashko Beliy” (Sasha White) definitely has his own style of negotiating. “The Right Sector was armed and will be armed till the time when it will be necessary,” Muzychko said, dressed in camouflage. 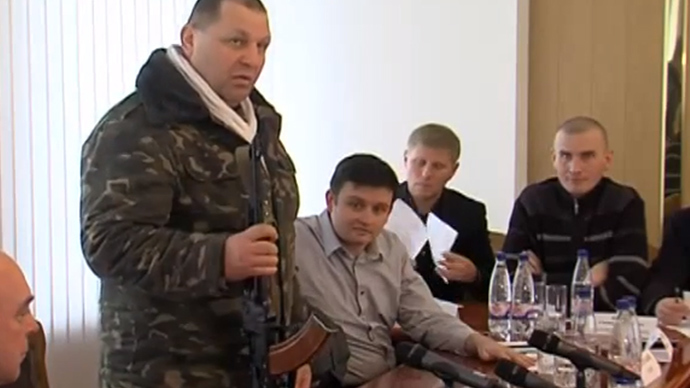 As if to prove his words, he pulled an AK-47 machine gun out from under the table of a local Ukrainian parliament. “You did not give us this weapon and you will not take it away. Who wants to take away my machine gun, my pistol, my knives? Let them try! As Americans say, ‘God made every man different; Sam Colt made them equal!’ I will put aside my Kalashnikov only when order in Ukraine is restored,” he said. In the video, titled “Sachko Communicates with a Prosecutor,” he hoarsely yells at a prosecutor of Rovno (Rivne) Oblast after being told a criminal investigation into a local murder is being delayed. Snatching the prosecutor’s tie, Sashko threatens tie him up with a rope and pull him to Maidan. He proudly calls himself a “Ukrainian nationalist.” In this video from 2010 found on Youtube, he is seen haughtily playing with weapons. Igor Mosiychuk was sentenced to six years in January this year for plotting the demolition of the monument to Lenin, but has just been released as “a political prisoner.” He almost literally stepped from prison to a Ukrainian TV station where he shared his group's views and threatened “harsh punishment” to those who try to split Ukraine. He called on the Right Sector to move on Crimea. Negotiations between far-right groups and local authorities seem to be far from constructive and peaceful. Ultra-nationalists, accompanied by masked people in camouflage with batons in hand, show no respect. 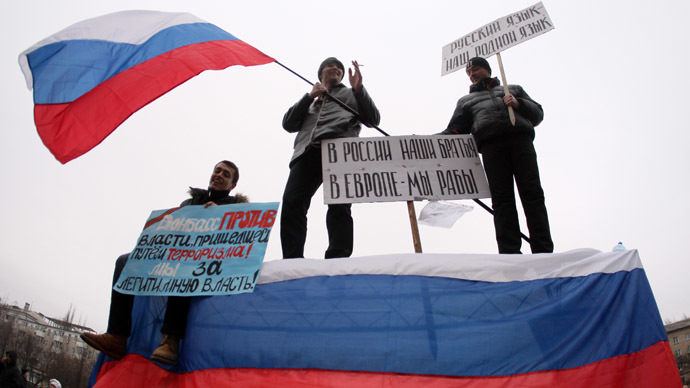 The people of Vasylkov don’t want ultra-nationalists in their city, which is located some 25 kilometers from Kiev. A verbal fight between the two groups risks evolving into real clashes. The Patriots of Ukraine is a well-structured group that mainly consists of football ultras, professional raiders, and militants. They all undergo illegal military training, using real weapons, in various parts of Ukraine. This video provides a perfect understanding.